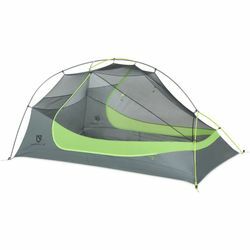 NEMO Dragonfly 2P Ultralight Backpacking Tent. Dragonfly™ fills the void for most backpackers with an ideal balance of weight and livability in a freestanding tent. The large trapezoidal vestibules are designed to fit gear without obstructing entry and have multiple roll-back points to customize visibility and coverage. Large doors and trapezoidal vestibules with multiple roll-back points for customizable storage and ease of entry. Hubbed, pre-bent DAC Featherlite poles with high-arching main pole significantly increase volume at the head, peak, and foot ends. White No-See-Um Mesh on side panels adds privacy while a black mesh top offers clear stargazing at night. Integrated 20D Nylon tub provides an ultralight, waterproof floor, and premium 15D Nylon Ripstop fly is coated in a durable silicone repellent for reliable and durable weather protection. Single-seam tub construction and silicone-impregnated fabric ensure increased longevity and greater sustainability. Overhead Light Pockets™ use special light-diffusing fabric to cast an even glow with a headlamp and Gear Pockets™ offer storage for personal items.